Get ready to boldly go with the first Starfleet ship in the line to not carry name Enterprise and a very cool looking Klingon Bird of Prey. One of the most fan-requested Star Trek ships, the Excelsior-class U.S.S. Enterprise NCC-1701-B starship is finally on its way! Based on the ship's sole appearance, in Star Trek: Generations, the Enterprise-B features authentic sounds and dialogue from the film, as well as light-up weapons and engines. 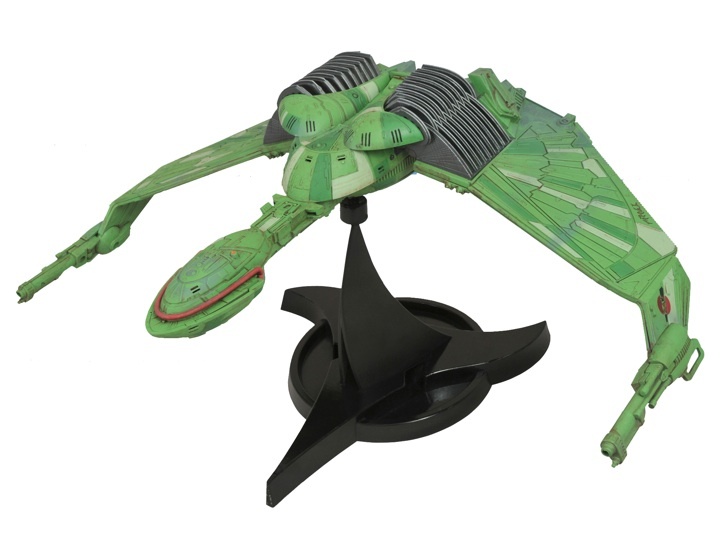 The ship measures 16 inches long and comes with a Starfleet-insignia display stand. Both ships will be available by the end of the year and, even better if you missed a few of these, the rest of the line is being reissued right along side them. Expect to see the older craft releases staggered from now through the Spring of next year.